Technology is creating the most exciting innovations the world has ever seen. It is also causing anxiety about our future. Navigating technological change at light speed is much harder if you don't have a trusted Sherpa to be your guide. 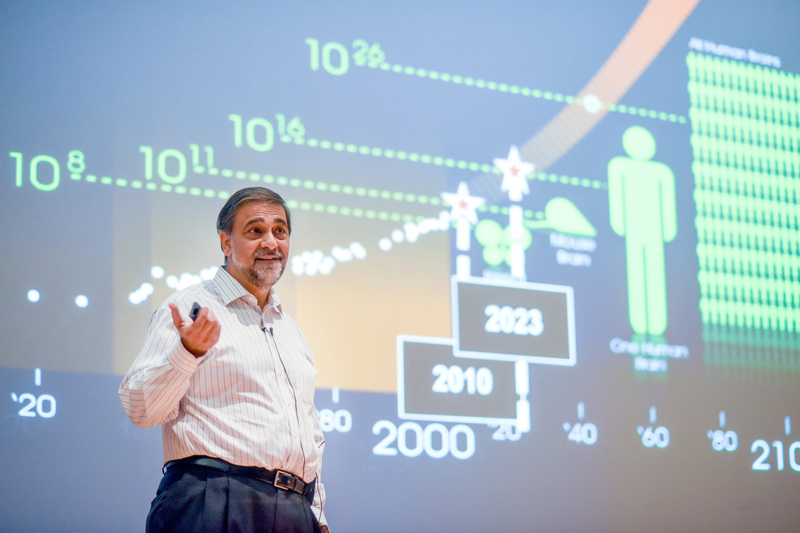 Vivek Wadhwa (bio) has become a globally respected voice on advancing technologies and innovation (He was just named Silicon Valley Forum's 2018 VISIONARY AWARD-WINNER. Past honorees include Bill Gates, Elon Musk, Linda Rottenberg, Scott McNealy, Ray Kurzweil, Reed Hastings, Tim O'Reilly, Padmasree Warrior, Anne Wojcicki, Reid Hoffman). Not long ago, you could see your competition coming. Management guru Clayton Christensen coined the term "disruptive innovation" to describe how the competition worked: a new entrant attacked a market leader by launching low-end, low-priced products and then relentlessly improving them. Now Christensen's frameworks have themselves been disrupted...because you can no longer see the competition coming. Technologies are no longer progressing in a predictable linear fashion, but are advancing exponentially and converging. Fields such as computing, medicine, artificial intelligence, 3D printing, robotics, nanomaterials, and synthetic biology are advancing simultaneously, and combining these allows one industry to rapidly disrupt another before market leaders even know what has hit them. Practically every industry will be disrupted over the next few years, including finance, insurance, healthcare, manufacturing, transportation, education, I.T. services, and communications. Very few of today's Fortune 500 companies will be on that list by the early 2020s. They will go the way of Blockbuster, Kodak, RIM, Compaq, and Nokia. Vivek Wadhwa will teach the basics of exponential technologies and convergence, provide examples of the disruptions that are underway in several industries, discuss the new rules of the innovation game, and challenge his audience members to think like today's technology entrepreneurs, and to build the new billion-dollar businesses within their companies. When Apple announced that it was developing a watch that had the functions of a medical device, it became clear that the company was eyeing the $3 trillion healthcare industry; that the tech industry sees medicine as the next frontier for exponential growth. Apple isn't alone. Companies such as Google, Microsoft, and Samsung and hundreds of startups also see the market potential and have big plans. They are about to disrupt health care in the same way in which Netflix decimated the video rental industry and Uber is changing transportation. We will soon have sensors that monitor almost every aspect of our body's functioning, inside and out. By combining these data with our electronic medical records and the activity and lifestyle information that our smartphones observe, artificial intelligence-based systems will monitor us on a 24x7 basis. They will warn us when we are about to get sick and advise us on what medications we should take and how we should improve our lifestyle and habits. And with the added sensors and the apps that tech companies will build, our smartphone will become a medical device akin to the Star Trek tricorder. Washington Post: If you could ‘design’ your own child, would you? Washington Post: Self-driving cars should leave us all unsettled. Here’s why. LinkedIn: Our Technology Future: "Star Trek" or "Mad Max"? Hailed by Foreign Policy Magazine as a "Top 100 Global Thinker," professor, researcher, and entrepreneur Vivek Wadhwa, alongside award-winning journalist Farai Chideya, set out to collect anecdotes and essays from global leaders, sharing how their experiences in innovative industries frame the future of entrepreneurship. With interviews and essays from hundreds of women in STEM fields, including Anousheh Ansari the first female private sector space explorer, former Google[X] VP and current CTO of the USA Megan Smith, Ory Okolloh of the Omidyar Network, venture capitalist Heidi Roizen and CEO of Nanobiosym Dr. Anita Goel, MD, PhD, Innovating Women offer perspectives on the challenges that women face, the strategies that they employ in the workplace, and how an organization can succeed or fail in its attempts to support the career advancement of women. Vivek just rejoined Harvard as a Distinguished Fellow, Harvard Law School, Labor, and Worklife Program, where he will help lead a critical three-year research project on the effects of technology on future employment and work. This will be the first study on how technology will affect the core foundations of our economy. Vivek's syndicated column for The Washington Post is one of the world's most popular columns on all things technology and innovation. His newest bestselling book is Your Happiness Was Hacked: Why Tech Is Winning the Battle to Control Your Brain--and How to Fight Back. Previous books include the award-winning,The Driver in the Driverless Car: How Our Technology Choices Will Create the Future, he also wrote The Immigrant Exodus: Why America Is Losing the Global Race to Capture Entrepreneurial Talent, which was named by The Economist as a Book of the Year of 2012, and Innovating Women: The Changing Face of Technology, for which the Financial Times named him #2 on its global list of the top ten men worth emulating.